It’s hard to believe that the summer is already winding down and Labor Day is right around the corner, which marks the seasonal shift to fall! Labor Day– the first Monday in September was created by the labor movement in the late 19th century and became a federal holiday in 1894. Labor Day also symbolizes the end of summer for many Americans, and is celebrated with parties, parades and athletic events. My dogs and me could not be more excited about some cooler temps! In a last ditch effort to squeeze in some bits of summery fun, I’ve been making the most of these last few (hot!) weeks of summer poolside with my furry companions. 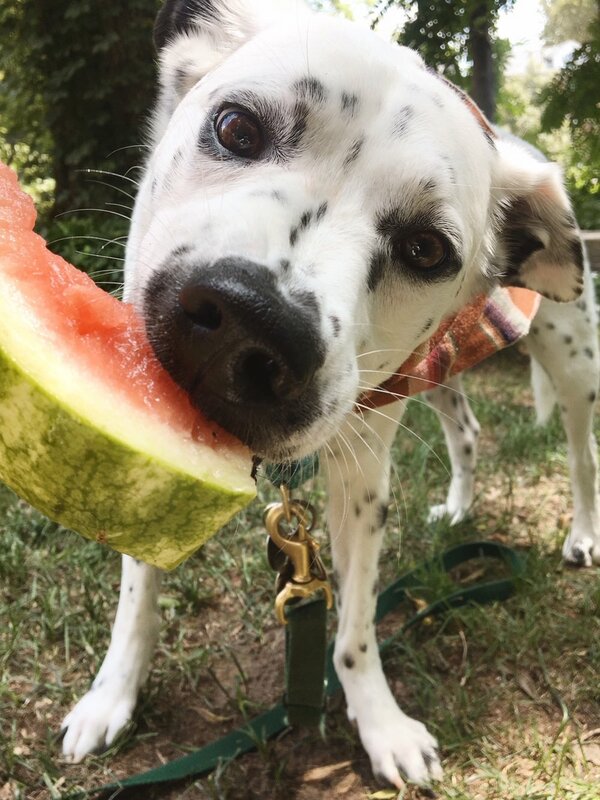 Lots of watermelon has been involved. LOL! In this post I will be sharing some ways you can celebrate Labor Day with your furry companions, Henry's adoption story, along with some great ways Autotrader is helping these precious animals and families that adore them! One of our favorite days of the year is coming soon – National Dog Day! In honor of National Dog Day on August 26th Autotrader is actually teaming up with Adopt-A Pet which is so exciting! There’s nothing like that first ride home with your new addition in the seat next to you-or in Henry's case..on-top of you! Autotrader is celebrating these special unforgettable moments with the launch of Dogtrader.com for a limited time to help dog lovers find their new best friend for life. Autotrader will also offer valuable information on the best new and used pet-friendly rides, must-have accessories to keep your furry friend comfortable, and tips to keep your pup safe on-the-go while traveling. I immediately e-mailed the shelter that had taken "Spot" in and confirmed he was still available for adoption. I submitted our applications and fees and even included photos of Melvin. I did all of this by 10:00 a.m on a Tuesday morning. And it was the most agonizing Tuesday of our lives. Every time I received a new email notification alert I would race to my phone but sigh, no response from the shelter. And they did not have a phone number. I tagged them on a facebook post to inform them that I was interested in Spot and to check their email spam folder. I tried everything. 4 days went by---four long days. We were devastated. Had Spot already been adopted? Was the shelter owner not liking something about us? So many questions ran through our heads. Lin even emailed the shelter. We found ourselves unable to take our eyes off the photo of a small scared skinny dog staring directly into the camera. I had indeed gotten my hopes way up. On day 5 since submitting the adoption application we FINALLY got the email I was waiting for. Well..kind of. We would exchange phone numbers and I would learn the sad story about how Spot and Kim (shelter owner) met. She approved our application to adopt "Spot"..a 3 month old puppy who had been found on the brink of starvation. dehydration and exhaustion wondering around with three other dogs. He was taken into the city pound and was one day away from being euthanized due to over crowding. Kim's shelter was also full at the time but seeing this facebook post she was drawn to these 4 dogs and decided to pick them up from the pound. The other 3 dogs were old and she could kennel them together and she would keep "Spot" in her personal home to nurse him back to health. I was so incredibly sad and thankful and grateful all at the same time. And was just eager to meet our puppy. We made plans to pick him up over the weekend at the shelter about an hour and a half outside Tulsa. I rushed to the store like a nesting mom-HA-and bought him a leash, a collar, a bed..all the essentials. I printed the photo of "Spot" and kept it on the fridge. This adoption was a for sure deal and it was happening!!!! But then we got a call late in the night. It was Kim. I could tell she had been crying. My heart sank to the ground. Had something happened to our pup? She explained that the three dogs that Spot had come in with died from Parvo earlier that evening and Spot was taken to the vet as it's contagious and was being evaluated there over night. He had gotten very sick that day and the vet said if he did not respond to the treatments they were doing that he probably wouldn't make it overnight. She wanted to refund our money and did not feel hopeful. We were crushed. My heart was not ready to say goodbye to this sweet puppy I had never even met before but already was so connected to. I am not too religious but I prayed. I journaled manifesting good health to this pup and just hoped for the best situation come morning. Morning came and the phone rang around 8:00 a.m. "Spot" made it. Our resilient dog made it! But he wasn't 100% in the clear. They needed to take things day by day. So the adoption would have to be extended to another date three weeks away so the vet could care for "Spot". If anything changed with his health Kim would let us know. Sigh. Three more agonizing long weeks with no guarantee of having this dog..
Luckily I had to travel to New Orleans for NOLA fashion week during this time. It at least kept my mind occupied because I was going insane at home. Every time my phone rang, my heart sank thinking the worst. And at last on a chilly Saturday morning three weeks later, we made the drive to finally meet our puppy! And the rest is history. Years later and we are STILL so madly in love with "Spot" whom we renamed Henry. He is so sweet natured and truly is our king. He's the first one to wake up and the last one to go to sleep as he wants to make sure his family is where they need to be. He loves car rides, peanut butter, watermelon, and he loves his brother from another mother Melvin. I am so grateful to Kim for taking a chance on him and for the vet and everyone who gave this guy a shot! He truly is my hero and has made our family of 4 complete!!! Pet adoption is so rewarding and powerful ya'll. CHEERS TO HENRY RUBLE BACON!! Considering adopting your best friend for life?! Now would be the perfect time to get homeless dogs out of shelters and into loving and caring homes just like yours. Just click here and input your zip code and find your very own Henry dog. You can also check out the ten greatest cars for dog lovers which is really important because pets are a part of our family, and because of this, when we travel, they travel. Autotrader also has valuable info on the must-have accessories for your pet as well as some awesome tips on for amazing road trips with your pup. These dogs need you. And more importantly, you need them. The bond and love between your rescue and you is the most special bond you could ever experience in your life. I believe they know you saved their life and for that..they will forever be loyal to you and teach you unconditional love. I adore Henry with every ounce of my being. He makes me life full and I cherish every moment we have together. I want that for each of you reading this. Do your part and let's clear the shelters! But you can also swim. There are several community pools which have scheduled a specific day for dogs to enjoy the water, especially since they are closing the pools for the season. You can also go hiking or camping. If you and your dog hike regularly, make the weekend special by visiting a new area. If you’ve never hiked with your dog, it’s an excellent time to start. Picnicking too--taking your dog on a picnic might sound crazy but your dog will enjoy the change of scenery and time spent with you. Use the commands your dog knows to make the event pleasurable. Henry just loves being with me so he's happy to be included. And of course these dog days of summer deserve cuddles and naps! Have you already adopted a dog?! Would love to hear your pet adoption story and the things you love doing with your pup in the comments below! I always love hearing from you. Tag me in your pics too when you go find and test drive pet-friendly cars from Autotrader. I am in the market for a new car and that's a whole other subject! Happy National Dog Day! – Lots and lots of Woofs!